In order to NOT be a clickbait blog post I’m just going to get to the shocking reveal right now instead of having you click through 75 slides in a predictable slideshow – the reason we watch turtles, or more aptly expressed – “watch FOR turtles”, is because the construction crew is in the process of taking an old platform or structure out of the water USING EXPLOSIVES! The thing about explosives used underwater is that they generate a concussive shockwave that can, and does, kill anything within a certain radius. One of the NOAA marine biologists I was flying today told me that each dead turtle, being a protected species, would cost the company that owns the platform $500,000. Understandably they aren’t eager to blow a bunch of turtles onto the half shell. The derrick barge (with cranes) had a smaller barge tied along side of it with the old platform top of it. The legs were set into makeshift braces for transport. My actual assignment this morning was “spare pilot” and I was assigned to the spare 407 we have at our base. There are days when the spare pilot has nothing to do but go stir crazy on the beach, and the rest of the time you’re flying as much or more than you would normally on your assigned contract. Spare pilots are regularly used as “recovery” pilots for helicopters that are broke down off-shore, flying mechanics and parts out so that they can get it fixed and back in the air. 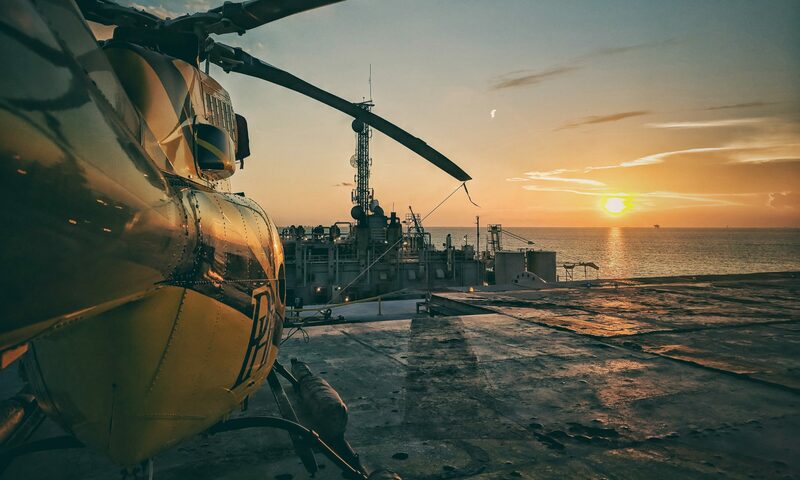 Occasionally our company fuel system engineers hop into the spare helicopter with the spare pilot and fly off-shore to service, repair, or inspect fuel stations. The rest of the jobs we get as spare pilots are known as “specials”, as in they are special and not usual – calling them “unusual’s” is a bit of a mouth full so we call them specials. These jobs can range from flying big-whig white collar types from New Orleans International out to inspect their brand new ship, or in this case – fly NOAA inspectors around a mostly demolished carcass of a platform looking for turtles. My first time landing on a barge in the Gulf! The old, now removed, platform in the background. When I went to pick up the logbook for the spare aircraft this morning I noticed somebody had inserted a printed out piece of paper into the front sleeve. Pulling it out I instantly recognized it as a “special flight request” form, because that’s what it says across the top of the form. The job itself was fairly simple, fly out to the construction barge, pick up the NOAA observers, fly 30 minutes of concentric ovals at precisely 60 knots and 500 feet. If, after 30 minutes of left turns (NASCAR) the observers haven’t spotted any protected biologics, such as turtles or dolphins, then the green light is given and the demolition crew blow up their charge. After which we fly an additional 30 minutes of concentric ovals while the observers count dead fish, and make sure that no turtles or marine mammals were killed. The old platform on its barge for transporting it back to land. You can see its 4 legs nestled into makeshift steel ports on the deck. Todays turtle watch went fairly smoothly. It took us 3 tries to get a clear perimeter for the blast, the first was interrupted by dolphins, the second flight yielded no less than one loggerhead turtle, and on the third flight we were in the clear. The explosion was more than a little anticlimactic though, I was hoping for a shockwave and a fountain of water like a depth charge had just gone off; what I got was a single streamer of water that looked like it was part of the fountain display at the Bellagio in Las Vegas. The area was so clear for the blast that they only counted 7 or so dead fish afterward. The deck was a very busy place with two cranes moving to work together in order to remove parts of the old platform structure and prep it for transport. All in a days work for a Gulf of Mexico Oil and Gas helicopter pilot. This is all that remains of the old platform. The blast today was used to remove some more submerged parts from this structure. Shortly after the blast they moved the entire barge back over to within crane range and got back to work. Enjoyed the click bait…. wait… blog… wait… turtles..Special Turtles….. Seriously, thanks for the blog. Loved it.